Futons have come to mean a type of mattress or cushion to sleep in, which can be stowed away after use. In Japan, where futons are thought to originate from, traditional futons are beddings that are laid out at night and folded and kept in storage in the morning. In Western countries, you can find the best futon mattress for sitting or futons that double as sofas when not used as a sleeping cushion. With so many options on the market though, finding the right one might be challenging and time-consuming. Hence, here are three futons that can double as a chair. A futon is an amazing addition into any home. What can be used regularly as a piece of furniture doubles as a comfy bed whenever needed. The foam is made from the polyurethane gel material. It is a popular material commonly known as memory foam. Memory foam is soft enough to provide a comfortable feel to it but dense enough not to give way to your weight and provide the necessary support. It springs back into its original shape after you get up from it. Standard size means it can fit in standard frames and sheets. A full futon frame is sold separately, which you can easily buy from any futon and mattress store. You can also look for one online. You really do not need to worry about the mattress and the frame not fitting together. The futon has a cotton twill cover that will last a lifetime. It is available in different colors, so you can choose the right one to match the color of your home. As expected from a futon, you can alternate between a sofa and a bed. Put it in an upright position, and you now have a sofa, and when you lay it flat, it can be used as a bed. Perfect for when you have a guest sleeping over, and you don’t have an extra room that they can stay. This is cozier than having to sleep in a regular sofa. The EMOOR Futon Mattress (Shikibuton) “Rococo” comes from Japan, and is made to follow the traditional bedding designs that are popular in Japanese culture. Owing to limited living spaces, futons of this kind are meant to be laid out on the floor and not on a frame, and should to be folded up to be stored in a closet after it is used. The EMOOR Futon Mattress (Shikibuton) “Rococo” is stuffed with polyester wadding that is treated with pyrethroid and quaternary ammonium salt which gives it its anti-tick, anti-bacterial, and deodorization properties. These last for about two to three years. The cover is made of cotton which gives it a natural and comfortable feel. This material is breathable, which allows the skin to breath when in contact with it. This means you can sleep in comfort, and wake up feeling refreshed. You can utilize this as a traditional futon that you lay out on the floor just like in Japan. Try to put it on top of another soft material, such as the tatami mat. You may opt to use it on a hard surface like concrete floors. Another use of this futon is that you can put it on top of a regular mattress. The DHP Independently-Encased Coil Futon Mattress is part of a line by Dorel Home Products of cushioned furniture. They include space solutions for those with limited living spaces. Futons are often thought of as innovative furniture that can help maximize space, especially in cramped out situations. The mattress is made up of quality foam and polyester layering, between the cover and independently encased coils. These add up to give an unmatched cushioning. The cover made of tufted microfiber gives a classy suede-like feel, which can provide a very relaxing touch. 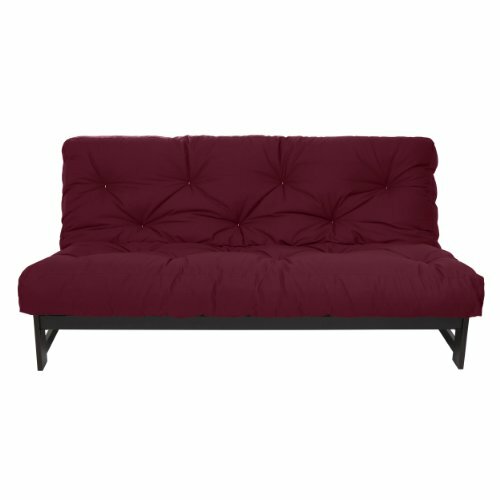 The futon comes in a standard size and can fit any full-sized futon frame. You can buy the mattress on its own if you already have the frame available, and if you are just shopping for a replacement mattress. You can get the frame separately if you are looking for a full set for a first-time purchase. The mattress can be converted between couch and bed. You and your guests can sit back and relax on the couch, and when someone is sleeping over, they can just adjust the mattress, and they can get a good night sleep on a comfy bed. The frame is sold separately. After evaluating all the products included in our best futon mattress for sitting list, we have made a decision as to what is the best of the best amongst the three. 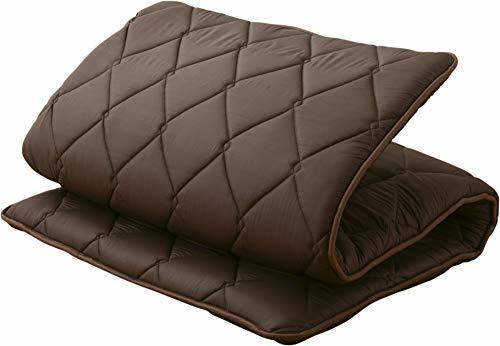 Summing it up, the EMOOR Futon Mattress (Shikibuton) “Rococo” for what it’s worth is a great futon for sleeping but is designed to be stored in a closet after use. It may be used as a cushion to sit on the floor, but may not be as comfortable as the other two. 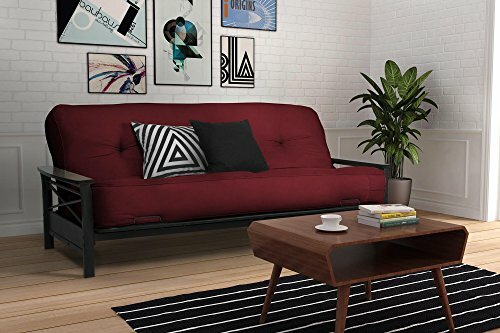 Both the Mozaic Full-Size Futon Mattress and the DHP Independently-Encased Coil Futon Mattress can be converted between a sofa and a bed when needed. Too bad that the frames for both are sold separately. That being said, between the two, the DHP Independently-Encased Coil Futon Mattress takes the lead because of its microfiber finish that gives it the luxurious look and feel.